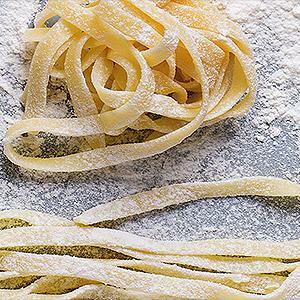 There is no substitute for fresh pasta in your favorite recipes. So, join us for this interactive cooking class you as your experienced culinary instructor, Bruce Campbell, teaches you the simple steps to making homemade egg pasta. He’ll get your evening started with a fresh Focaccia appetizer. Then, the cooking fun begins as you throw an apron on and practice the “well” technique as you work alongside Bruce and learn to make homemade Fettuccine, as well as cheese filled Tortellini. Bruce will also teach you how to make two classic Italian sauces, Marinara and Creamy Carbonara that will pair perfectly with your fresh pasta. As if this isn’t enough Italian love for one night, you will enjoy a lovely salad served with a perfectly paired Italian wine when you sit down around the table with new friends, and enjoy the pasta dinner you’ve helped prepare. We’ll finish our Italian feast with Fresh Berries and Zabaglione for dessert. Lots of pasta love all around! Mangia! Wed 6/5/19 6:30 - 9:00 p.m. NOTE: Unless otherwise noted, each evening class fee includes one glass of beer/wine, with additional beverages available at a nominal cost. If you plan to attend this class with another party who signed up separately, please add their name(s) to the COMMENTS section of your online registration so that we can seat you together; otherwise we cannot ensure that you will be seated together for the class. If you register for multiple students at one time, that registration will prompt you to supply the names of all students you are registering and we will know to seat you together. Thank you! Powered by © 2006 RezClick. All rights reserved. An error occured. Wait a few minutes then try again. If the problem persists contact technical support.